Hair dye can be extremely tricky to shop for. 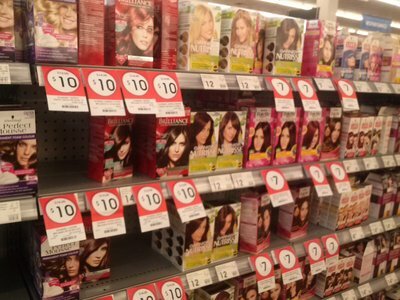 Some people prefer salon-specific dyes or brands, while others go for the supermarket brands. It can be difficult to find dye suited to your wants/needs while being reasonably priced. Where's the best place to buy hair dye in Sydney? I'm lucky enough to have a hairdresser friend who lets her apprentices train on me for super cheap, so at the moment I'm rocking a salon dye job to cover up my grown-out Manic Panic/ Fudge Paintbox crazy colours. You can buy Manic Panic at Fuzz in Newtown, and Fudge in many places, but I got mine at the salon underground near Town Hall station. Great question. I am more of a salon chick, yet for some DIY hair dye therapy - I love Priceline at Westfield Sydney. I go for the John Frieda mousse - at $22 value it is still exceptional value/no mess. Otherwise I had a lucky time at Woolworths Town Hall where that same product was on sale for only $7.50. Are you referring to Sydney CBD, or greater Sydney area? I recommend De Lorenzo dyes. However, you can't buy them, they are salon-only dyes, and you can find them in many Sydney regions. At the moment I'm using Manic Panic dyes. These and De Lorenzo would be readily available in Newtown. Depends on the type of dyes you want. Alternative/Bright/Punk/Goth or conservative? I haven't dyed my hair in a few years now, but I've always loved Priceline. They have so many options and really decent prices, which is handy if you've got long and thick hair like me and need more than one box to do the trick. I'll only use natural colours as I don't like the idea of using heavy chemicals on my head. Natural colours are usually more expensive but much healthier...for you and the environment. Logona is a very good German brand that I've used a lot over the years and can be bought either online or from organic and heath shops. Lush has a great range of natural colours too.